What is a 'Squattie'? 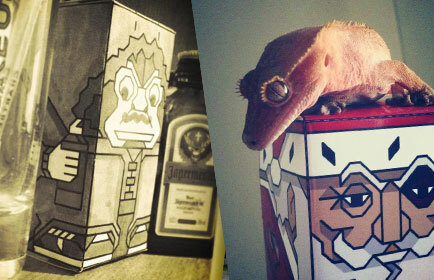 Who makes these paper toy characters? Why? Everything you wanted to ask but were too afraid to, in one convenient place. No? then send us an email, and questions will be answered. A Squattie character quite simply gets its name from it's appearance of being sat, seemingly squatting in a compressed cuboid shape. The Squatties project is a one-man affair under the supervision of designer and illustrator 'mo75' (birth name: Matthew Hitchcock). I was born in Exeter, in England's South West, and moved to the bustling and inspiring city of Bristol, to complete a degree in graphic design. 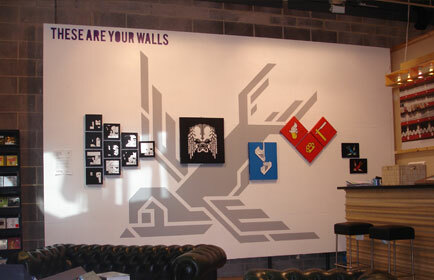 I am currently very privaleged to be working at the excellent design agency Taxi Studio. I've always been into making images in a graphic form from as early as I can remember. In the beginning, before I had my first computer with graphics software, a Commodore Amiga 500 with Deluxe Paint IV, I would use graph paper and produce intentionally minimal technical looking art. The Amiga became a defining tool in my formative years, it provided the means to consume and create digital art. I admired the detail that it was possible to cram into a relatively small canvas in the games I played, and I would emulate and iterate variations of my own pixel art an that of my idols. Many years later, and after lots of experimentation (or distraction) in the vast possibilities of image making, I refocussed my approach, and gave birth to what is now my preferred way of working. 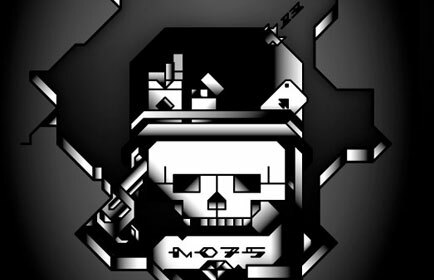 The illustration style has roots in 8-bit pixel art of classic computer games of the 80's mixed with a modern vector twist. The faux 3d stuff uses principles of axonometry, and I sometimes mix in traditional tattoo style shading. These angular, cuboid characters are made in my intentionally restrictive, trademark illustration style, which is permissive only of angles at 45° increments, on top of a small grid. Yeah, I'll be the first to admit that it's a little obsessive, but it seems to work. This principalled approach to image making and its imposed parameters, seems to be the key to focus my motivations to actually do something, opposed to just thinking about it. 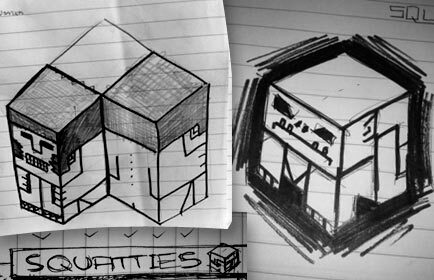 The actual geometric form of my cube style box characters is actually quite simple, but the process of characterising the blank box is where the challenge unfolds. Whenever I start out I’m never certain I will actually be able to represent the subject or whether it will be identifiable. I’m frequently pleasantly surprised. You might wonder what the connection is between the currenty array of characters. What actually connects Darth Vader to Gromit? The answer is quite openly, not very much at all, other than they are widely recognisable characters that are visually distinctive AND the characters mean something to me on some level. If something gets into my head because it's in the news, or I like the film, or I've been to a gig then chances are I will attempt to immortalise the subject into a Squattie. The regular person doesn't tend to be much fun to characterise. The more visually distinctive the subject the more satisfying the illustration process becomes. So far, I've drawn my inspiration from: Science fiction films, real life, musicians, animals, animation and Horror, amassing a collection of around 108 characters, with inexhaustable possibilities for many more. Why? a fair question. Primarily, Squatties are a personal excercise in character design. Something I create for pleasure in what little spare time I can muster. 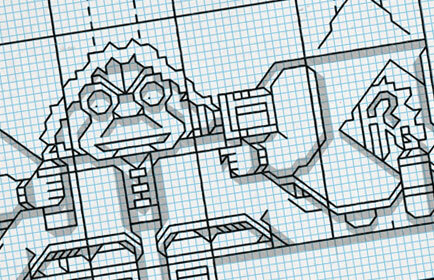 Periodically, Squattie designs will become available as paper toys for you to download and build. There are curently papercraft model characters avaialable. A standard piece of printer card can be turned into a fun, inexpensive collectible desktop mascot or totem pole, with just scissors, and a little glue. I have also turned a design into a plywood box, which was coloured with spraypaint and lined with paint markers. It was sold for a charity auction and fetched £325. In the future, my Squattie designs might make their way into other uses. I'd be interested in hearing any proposals if you want to get in touch. The 3d character idea was born from the adaption of some 2d Canvas character studies I made for an exhibition at Urban Outfitters in Bristol in August of 2010. 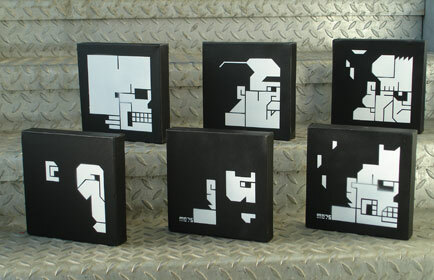 Collectively these canvas' were known as ‘The Heroes of Horror!’. I first started making Squatties back in May 2011. Back then they didn’t really have a name as such. They just were what they were. 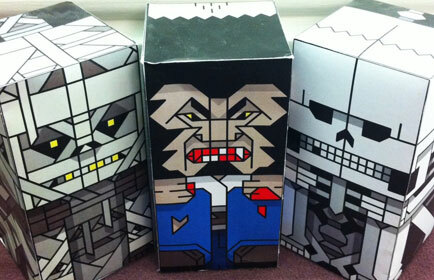 The first three were the Skeleton, Mummy and Werewolf. My illustrations depict characters in a transformative way. I create a parody of the original subject. I'm a fan, and what I produce is fan-art. Where applicable, there is no assosciation to the intellectual property owner unless stated. While the box shape is not an ownable asset, my work, the template design and ilustration that cover it, should not be copied or sold.